Basketball is one of the most popular sports in America. The sport has produced some of the greatest athletes known to sports, including Michael Jordan, Lebron James, Larry Bird (yes, we’ve got some old school Celtics fans here), Magic Johnson, and lots of others. 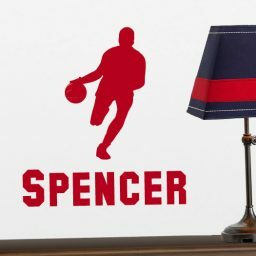 Celebrate your love of basketball by decorating your living space with a basketball themed vinyl decal that you can install on your wall, window, mirror, or other flat surface. Our basketball vinyl decals come in 25 different colors and small, medium, large, and giant sizes, so you should be able to find something that will fit your space and taste. Besides the size and color customizations, many of our basketball decals can be personalized with a player’s name and jersey number. These designs are perfect for team gifts to be given away at the beginning of the season or at the end of the year banquet. Lots of basketball teams buy a set for parents to put on the back window of their vehicles as a show of unity as the team travels to games and tournaments. 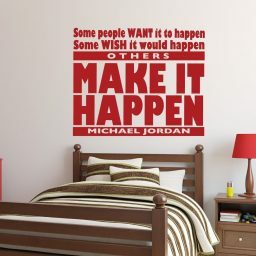 In addition to silhouettes of basketballs, players, and other designs, we also have motivational quotes meant specifically for basketball players as well as for athletes in general. If you need help finding what you want for your favorite basketball player(s), just contact our customer service, and we’ll get you all set up.